In 8-inch nonstick skillet, heat oil over medium-high heat. Add bell pepper, onion and mushrooms to oil. Cook 2 minutes, stirring frequently, until onion is tender. Stir in spinach; continue cooking and stirring just until spinach wilts. Remove vegetables from pan to small bowl. In medium bowl, beat egg product, water, salt and pepper with fork or whisk until well mixed. Reheat same skillet over medium-high heat. Quickly pour egg mixture into pan. While sliding pan back and forth rapidly over heat, quickly stir with spatula to spread eggs continuously over bottom of pan as they thicken. Let stand over heat a few seconds to lightly brown bottom of omelet. Do not overcook; omelet will continue to cook after folding. To make 2 omelets, double all of the ingredients, cooking egg mixture in 2 batches. Keep the first omelet warm by placing on a warm plate. 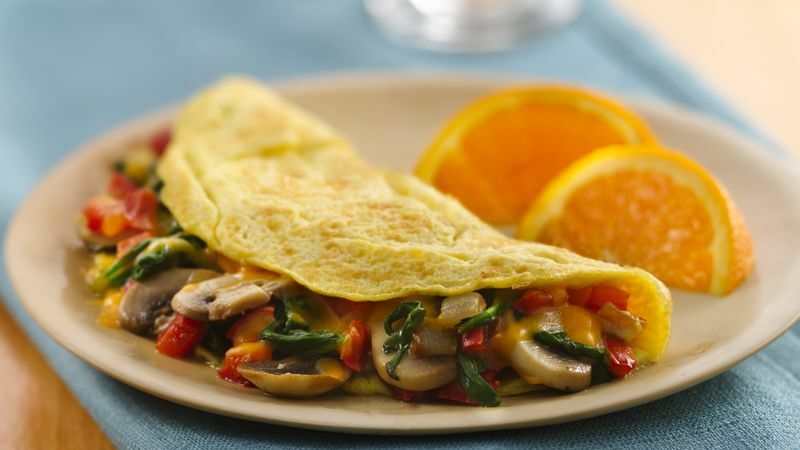 Topping each omelet with about 1 tablespoon salsa or hot sauce adds an extra burst of flavor.